We take care of your recurring billing so you can take care of business. CyberCom Pay lets you automatically process transactions based on frequency and next billing date for your subscription-based customers. Recurring payments automatically update the transaction record in your Merchant Console, giving you real-time data and reports. CyberCom Pay retries declined transactions for three days and notifies you by email and via an API callback so you can manage your subscription rates and recurring revenue. We also notify your customers one month prior to their credit card expiration date, alerting them to update their credit card details through our secure online portal for continuation of their subscription, reducing the opportunity for lost revenue. 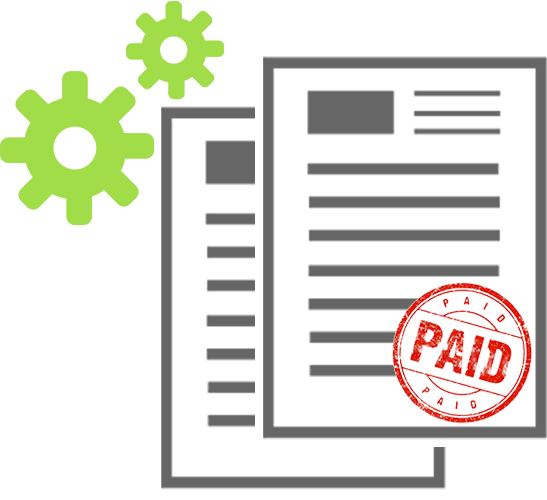 With CyberCom Pay recurring there are APIs available to manage your recurring billing. With callback URLs you can define how our APIs notify you, when any of the following events take place, failed transactions, subscription cancellations or suspensions so you can effectively manage your business and your cash flow. View your sales in real time within the merchant console. See all your active and inactive subscribers and the present and future values of your subscriptions. Go global and sell more. Earn more by accepting international currencies. Accept payments in 12 major currencies. NZD, AUD, USD, CAD, GBP, EUR, ZAR, CNY, HKD, SGD, KRW and JPY. 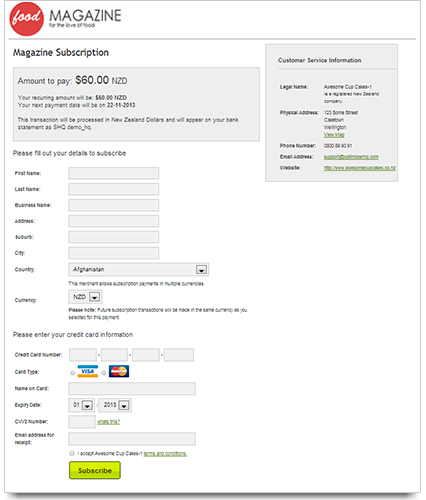 A simple yet powerful interface allows you to customize your subscription templates. Customizable options include initial set up costs and the tax rate and currency that will apply. Specify the duration, ongoing or fixed term and set the frequency of the plan. Add your own terms and conditions and stylize your own subscribe buttons. Whether you transact a little or a lot, you’ll only ever pay for what you use. We have merchant terms and conditions for legal reasons but beyond that we won't hold you to anything.Our banking partners may have agreements with you for legal reasons. One fixed rate of 2.85% for national/international transactions* and 1.29% for registered non-profit organisations. All you need is your CyberCom Pay Merchant Account to start accepting credit cards online. Your money is automatically settled in your account within 5 business days with no withdrawal fees. You can accept VISA and Mastercard credit and debit cards issued from anywhere in the world. No, Unfortunately we no longer support card readers and thus we no longer accept EFTPOS cards. Can I accept debit cards with CyberCom Pay? Yes, only VISA and Mastercard credit and debit cards issued from anywhere in the world. No, we will arrange to get you one when you apply with us. This may require some more information and documents to be provided to our banking partners. Are there fees for international transactions? The international transaction rate is also 2.85%. For merchants in the older system the transaction rate is 3.25%. 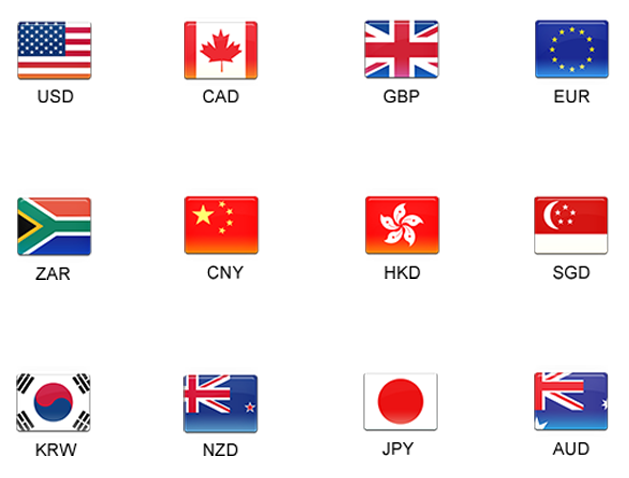 New Zealand Dollar (NZD), Australian Dollar (AUD), Canadian Dollar (CAD), Euro (EUR), Great British Pound (GBP), South Korean Won (KRW), Singaporean Dollar (SGD) Chinese Yuan (CNY), United States Dollar (USD ), South African Rand (ZAR), Hong Kong Dollar (HKD), Japanese Yen (JPY). For new merchants provisioned after 30th June 2017: There is no monthly fee. If you do not have any transactions in a calendar month there are no fess. However, If you transact up $700 in a calendar month the total transaction fee for that month is $20. If you do more than $700 per month then the transaction fees are 2.85% of the total amount.For old merchants provisioned before 30th June 2017: There are no ongoing monthly charges if you only have CyberCom Pay Online services. What shopping carts does CyberCom Pay integrate with? Swipe currently integrates with several of the world’s top Shopping Cart systems. We’re adding more all the time. For a list of who we work with, click here. What is the national transaction rate? 2.85% for national transactions and 1.29% for registered charities (Charity rate can vary due to charity type). For merchants in the older system the transaction rate is 2.75% and 0.95% for registered charities. Once you sign up and submit the information required from the Sign Up Console. We will submit the information to our banking partners who will be in touch to go over the information and request some certified documents. Once they are satisfied with the information provided they will issue merchant ids. 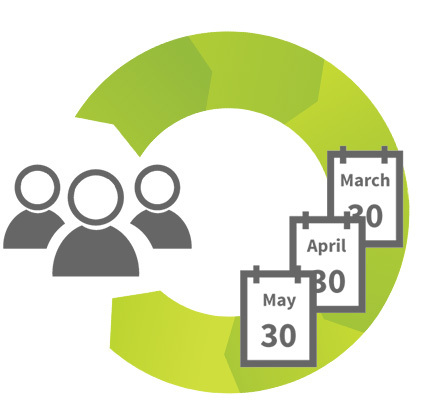 The total process can take up to 30 days from the time you have submitted your full application to us. How long does it take for funds to be settled? For new merchants provisioned after 30th June 2017: Funds are settled overnight in full as long as the transaction occurs before 6pm otherwise it will be settled the next day. For funds settled on Weekends & Public Holidays, they will be available on the next working day.For old merchants provisioned before 30th June 2017: It takes from 3 business days for funds to be settled into a nominated New Zealand bank account. Yes. CyberCom Pay complies with global Payment Card Industry Data Security Standards (PCI PTS 3.x). Data is SSL encrypted and securely transferred to our monitored secure servers. There is a one-time set up fee of $99 +GST. Why am I seeing SHQ* on my bank statement? 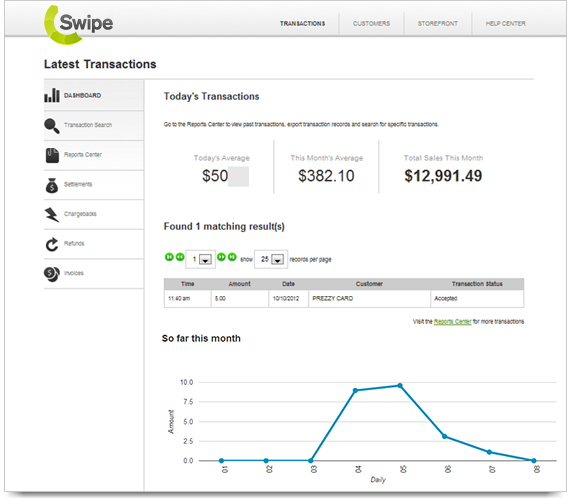 Swipe is an online payment processing service used by thousands of small business owners in New Zealand. Chances are, that you used your credit card to purchase some goods and/or services from one of the businesses using CyberCom Pay as their payment gateway. Click here for more details. Search our online help database. Know more. Expand your knowledge and grow your business. Information to grow your business and increase sales. Like to watch? Take the tour with CyberCom Pay. For developers. Code and API documents. Experience CyberCom Pay for yourself for free.